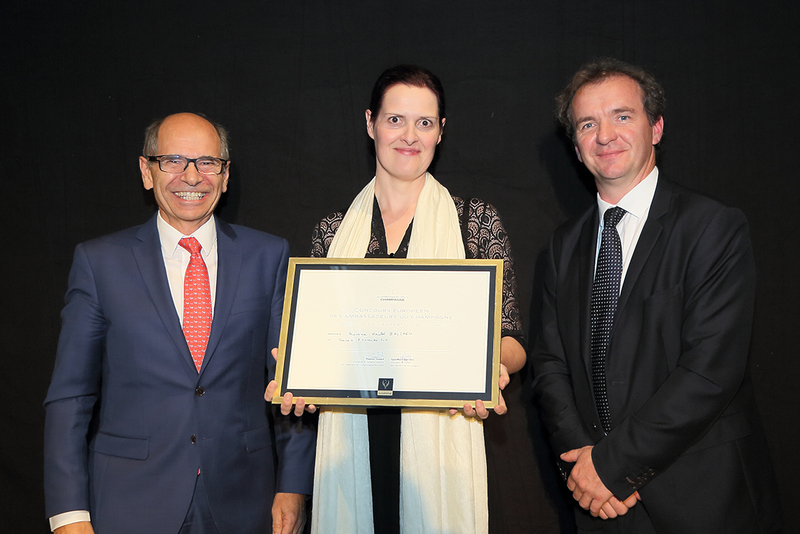 Kristel Balcaen, Vice-Lauréat du Concours Européen des Ambassadeurs du Champagne, with Jean-Marie Barillère and Maxime Toubart, co-presidents of the Comité Champagne. Last November, I got to represent Belgium in the ‘Concours Européen des Ambassadeurs du Champagne’ – the European Champagne Ambassadors’ Awards Competition – and I brought home the silver medal. This competition is organised by the Comité Champagne (CIVC), to honour wine educators and other professionals who ‘contribute knowledge, understanding and appreciation of the diversity of Champagne’. After a selection process starting in July, followed by the national finals in September, my 8 colleagues and I, the 9 Champagne Ambassadors of the participating countries Austria, Belgium, France, Germany, Italy, Spain, Switzerland, The Netherlands and the UK, were rewarded with a week-long trip in Champagne, which included masterclasses, winery visits, a wide variety of tastings – and: the European finals. What an unforgettable week it was: full of opportunities to expand our knowledge about champagne and more specifically to delve deeply in this year’s theme of disgorgement and dosage in champagne wines. We got to attend masterclasses, visited champagne producers and got to pick the brains of renowned cellar masters, but above all: I’ve acquired a bunch of champagne-loving friends-for-life. Then to top it all off, we were treated to a grand gala dinner with a hundred champagne winemakers and industry representatives, where the 3 European winners were announced. Thanks to everyone who helped to make this week so amazing: the Comité Champagne, all the houses and winemakers who received us so graciously, and most of all my fellow ambassadors: Benjamin Zimmerling (Austria), Catalina Melniciuc (France), Fernando Mayoral (Spain), Heather Dougherty (UK), Pietro Palma (Italy), Reto Künzi (Switzerland), Sabas Joosten (The Netherlands) and Stefan Metzner (Germany). And here they are: our gang of 9 Champagne Ambassadors, all very different, yet with so much in common. As a bonus: these (short) videos include a great insight into our fabulous week in Champagne!